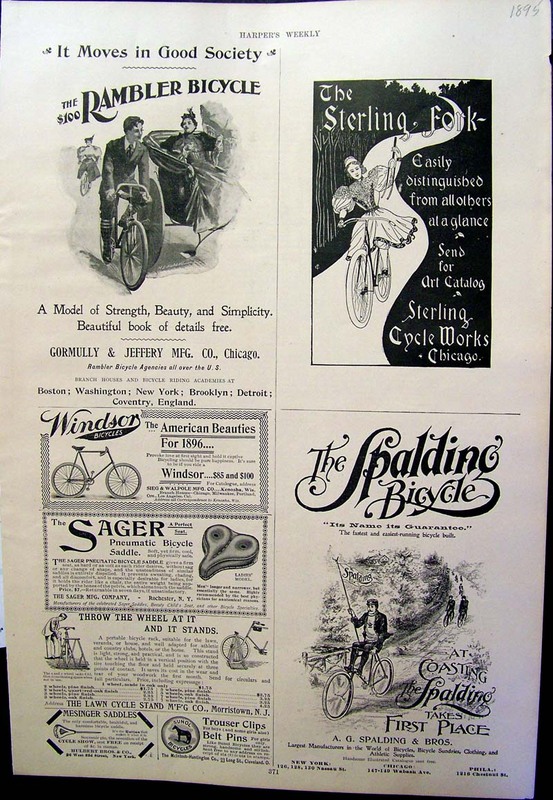 Bicycle - Bike - Velocipede - High Wheel Trike Prints. 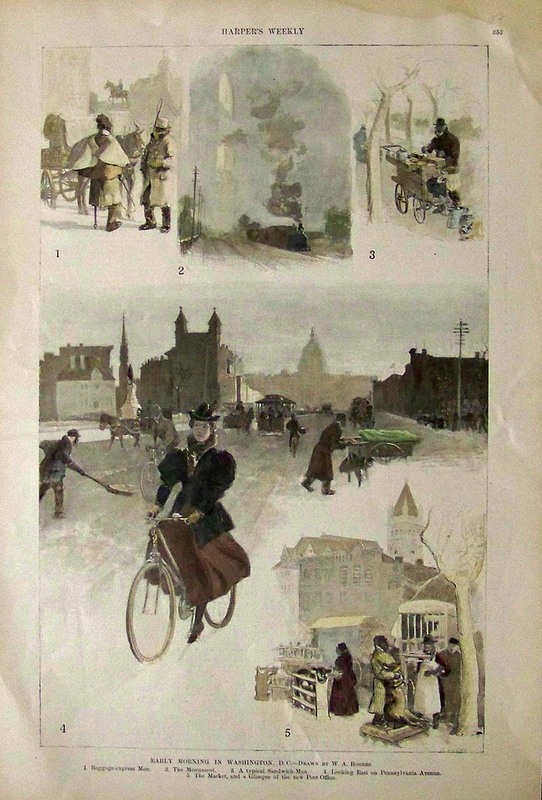 1897 Harper's Weekly hand colored wood engraving titled, "Early Morning in Washington, D.C." Drawn by W.A. Rogers. 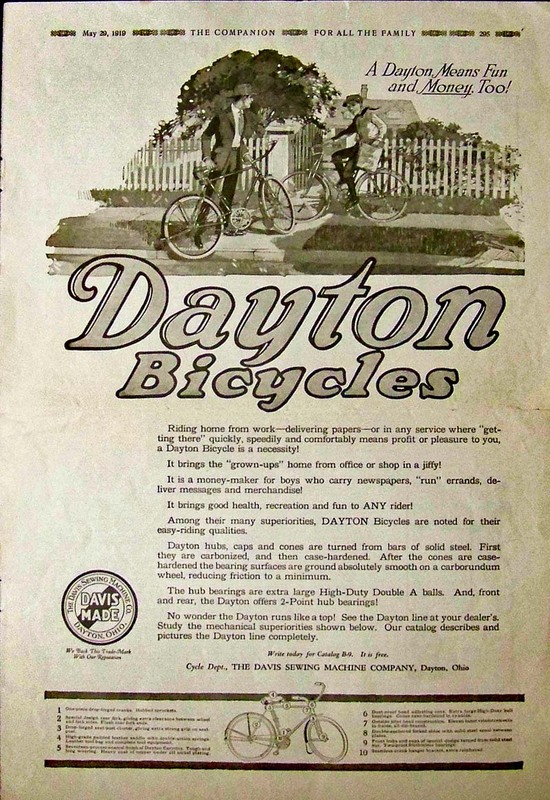 1919 Advertisement for Dayton Bicycles which was featured in The Companion. 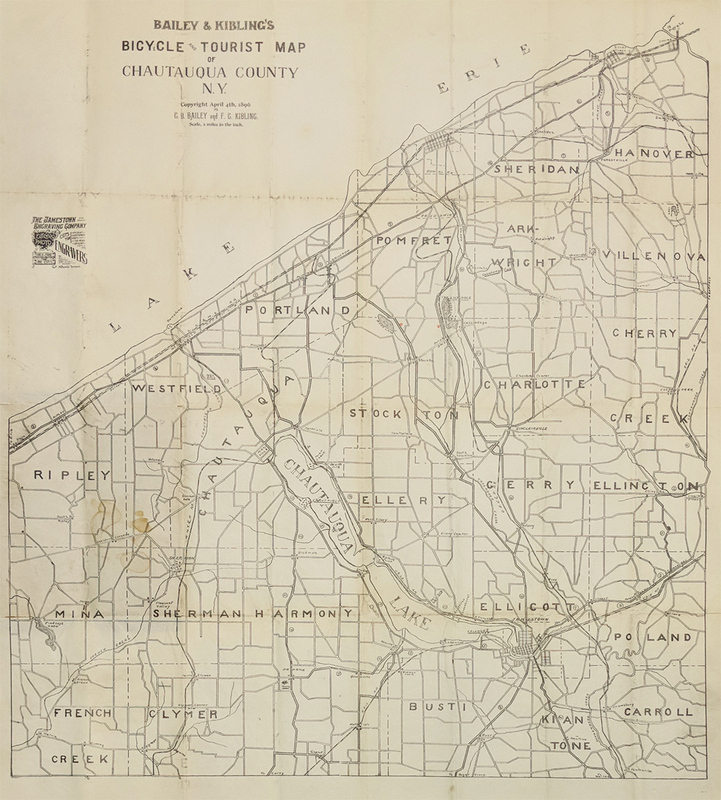 "A Dayton Means Fun and Money, Too!" 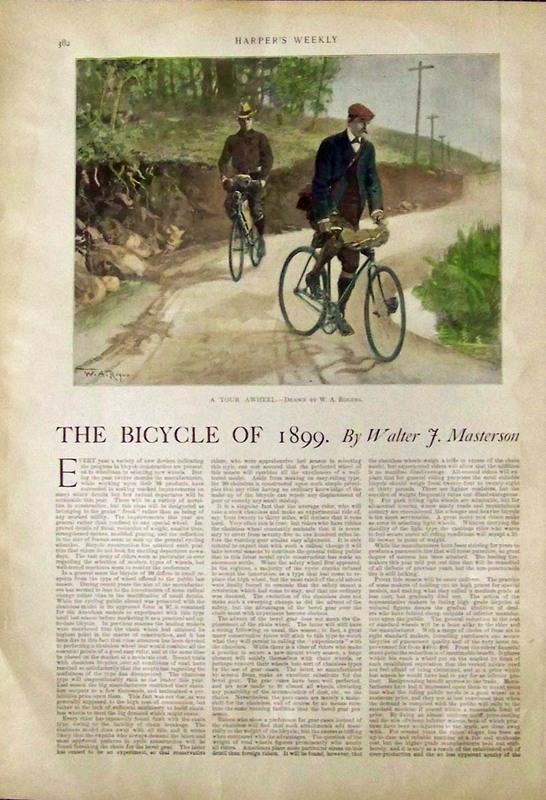 1899 Harper's Weekly hand colored half-tone with article about The Bicycle of 1899. Image by W.A. 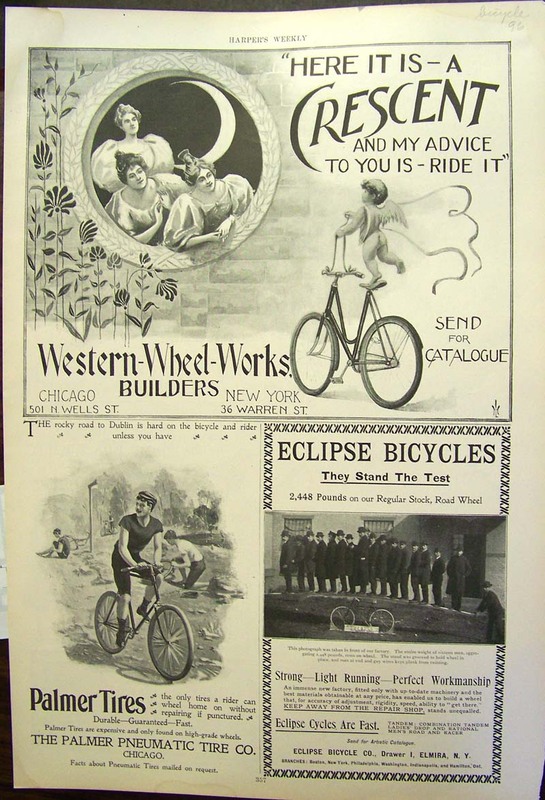 Rogers captioned, "A Tour Awheel." 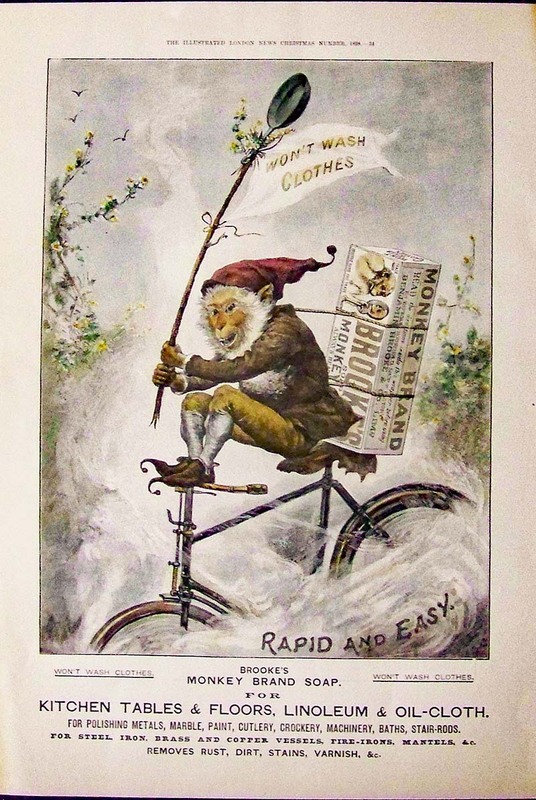 1898 Color advertisement for Brook's Monkey Brand Soap showing a monkey on top of a bicycle holding a frying pan and sign that reads, "Won't Wash Clothes." 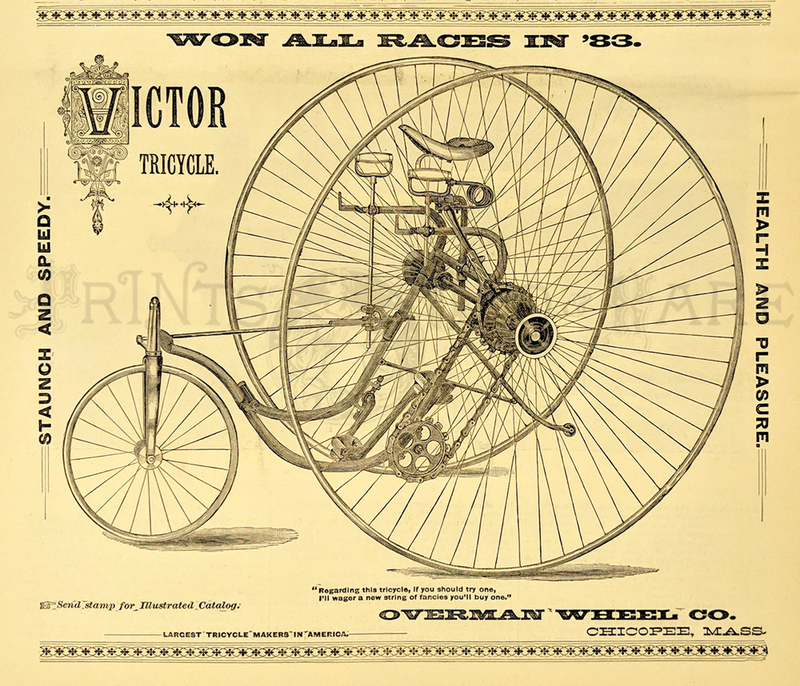 1884 Victor Tricycle advertisement. 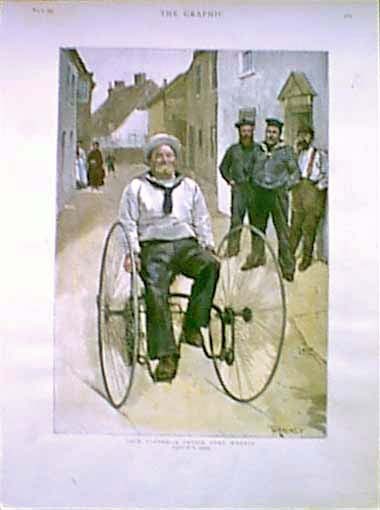 Overman Wheel Co.
Hand-colored Half-tone of Jack Ashore-A Cruise Upon Wheels. 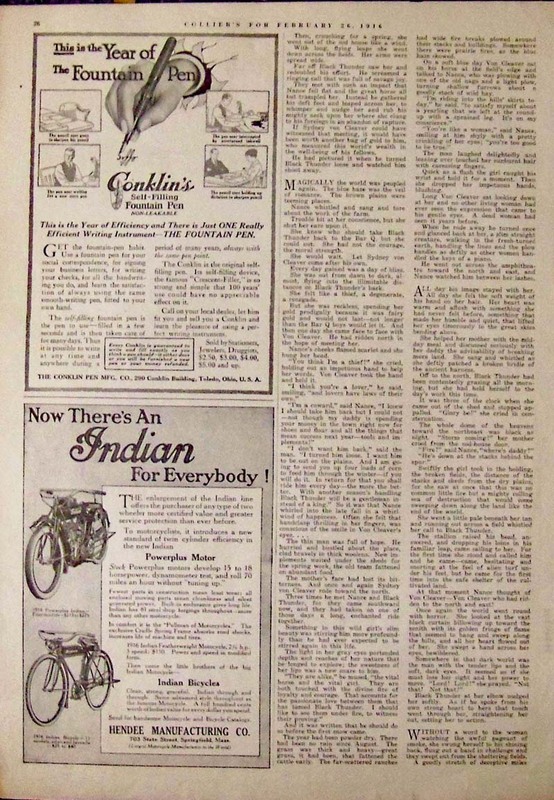 The Graphic dated May 9, 1891. 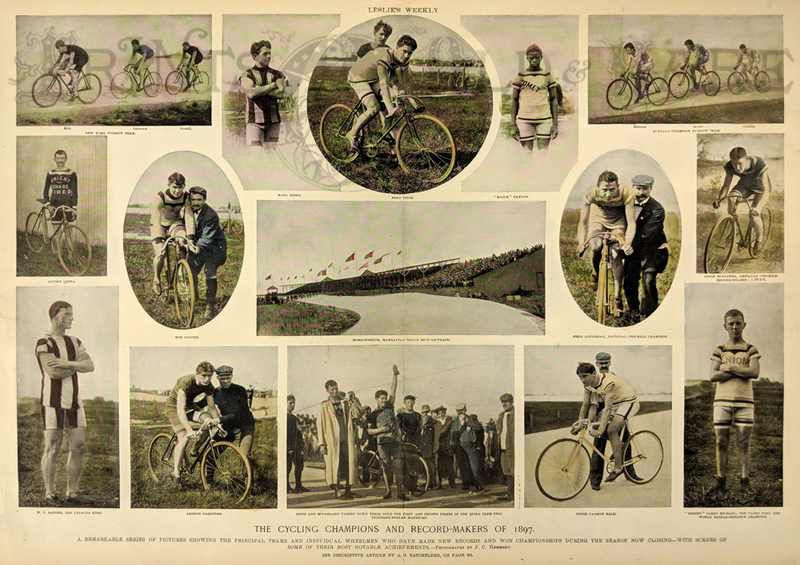 Hand colored scenes of various riders before the advent of the motor car. 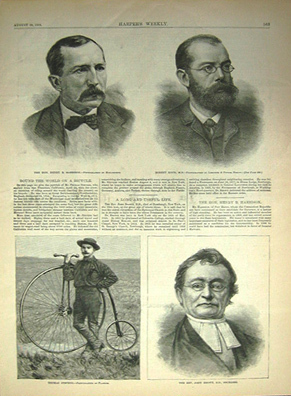 Double page from the June 18, 1896 issue of Collier's Weekly. Views include a variety of bikes and riders from the military & racing to pleasure. 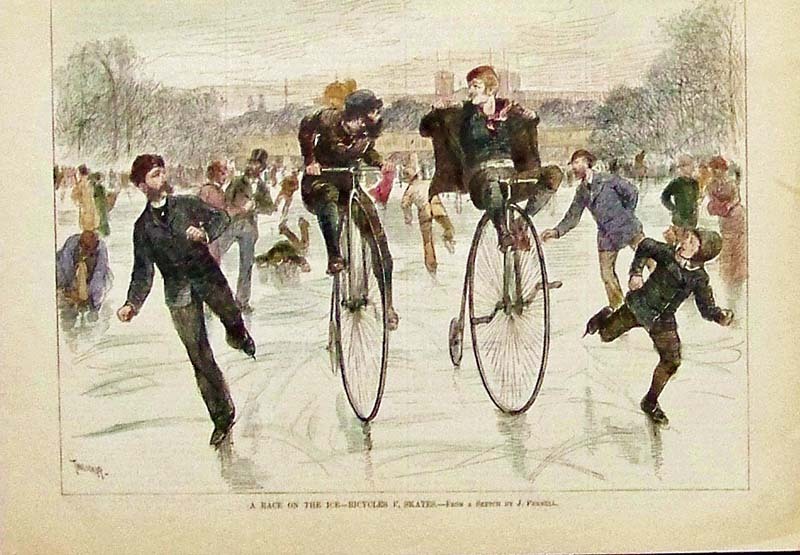 1881Harper's Weekly hand colored wood engraving titled, "A Race on the Ice - Bicycles V. Skates" Beautiful engraving showing riders on two high wheel bicycles racing against people on ice-skates. 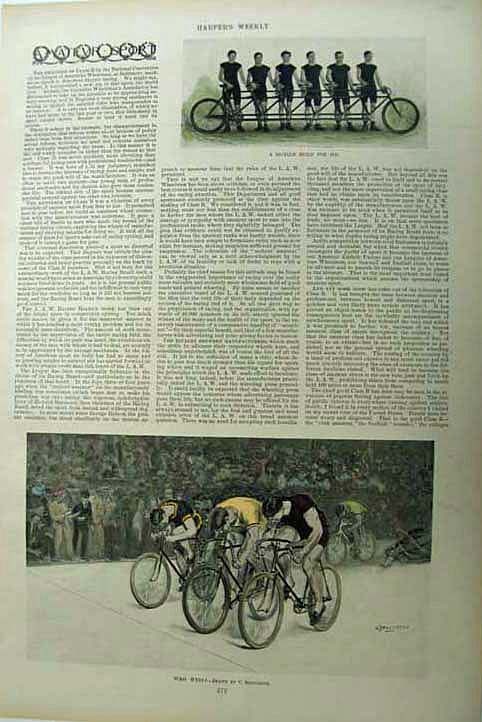 1887 Hand colored double page from Leslie's Weekly titled, "The Cycling Champions and Record Makers of 1897 - A remarkable series of pictures showing the principal teams and individual wheelmen who have made new records and world champoinships during the season now closing - with scenes of some of their most notable achievements." 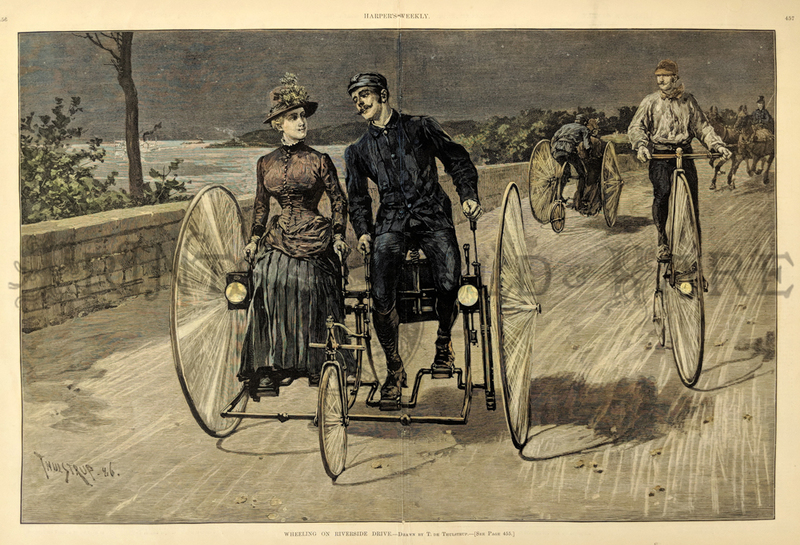 1887 Picture of a man and woman bicycling down Ripley Road in England. 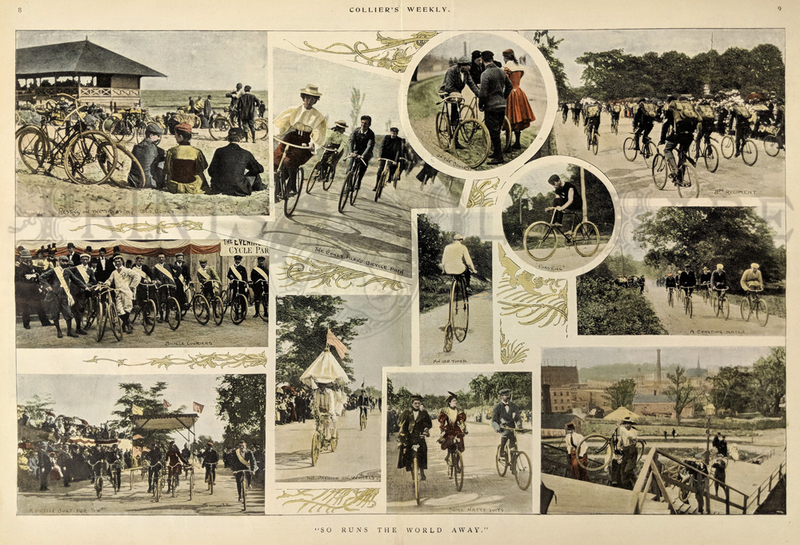 Beautifully hand colored wood engraving titled,"Cycling in England-Down the Ripley Road," drawn by Joseph Pennell from Harper's Weekly. 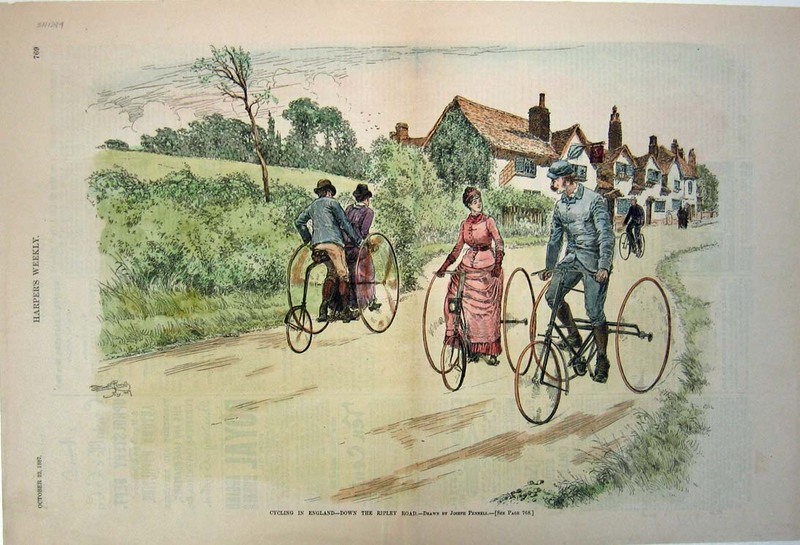 Shows scene of a man and woman bicycling down Ripley Road in England. 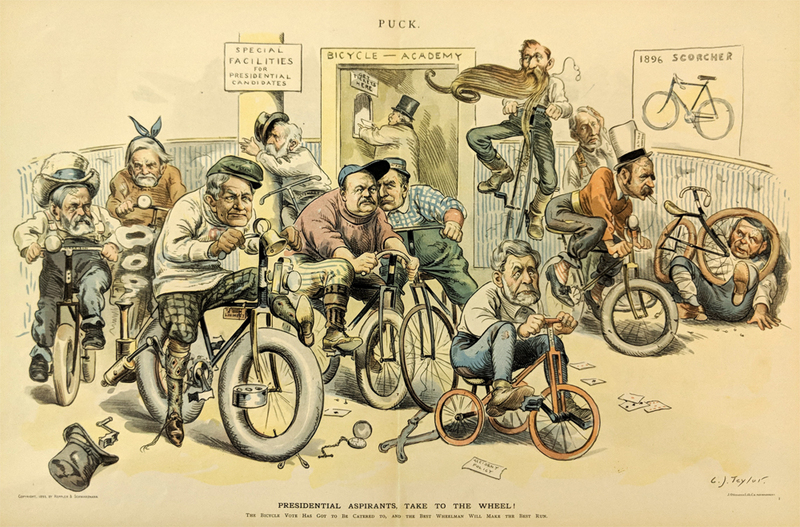 Puck's satirical look at the Presidential Canidates and their odds of winning by the kind of bicycle they are racing in "Presidential Aspirants, Take To The Wheel!" Color lithograph by C.J. Taylor. A.B. Frost "What Happened?" 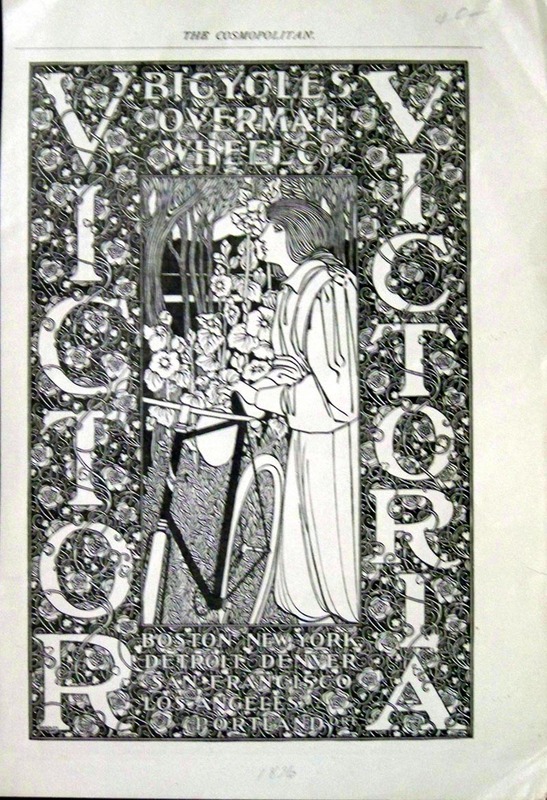 A niceley illustrated wood cut engraving dated 1897. 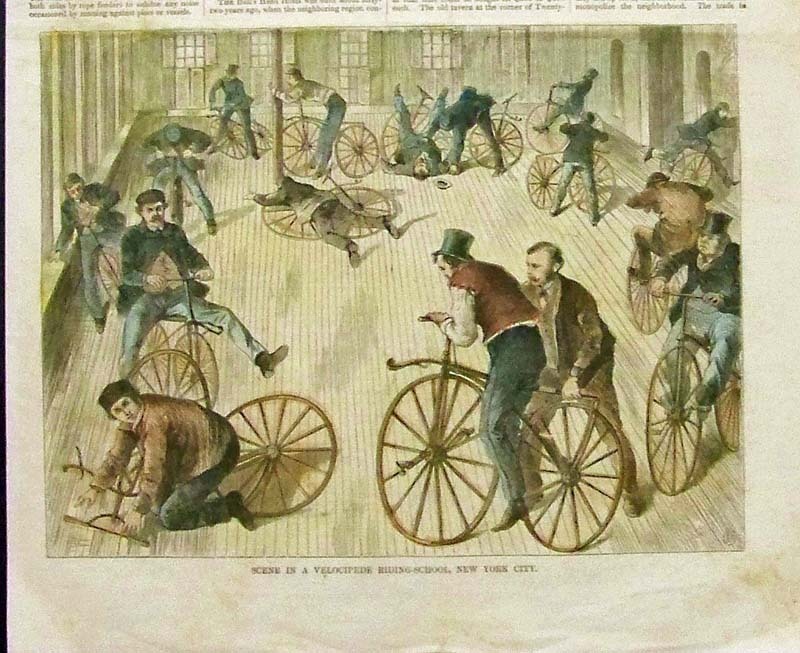 Shows a confused bicycle enthusiast who clearly needs more lessons. 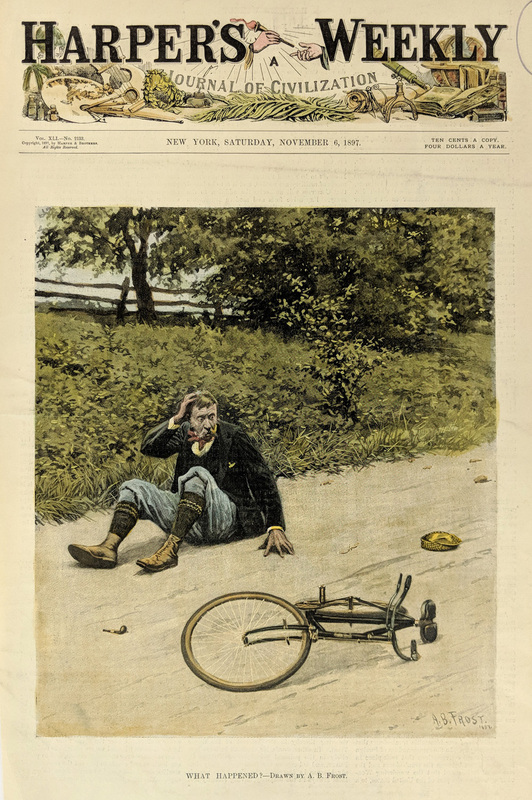 Hand colored Harper's Weekly cover. 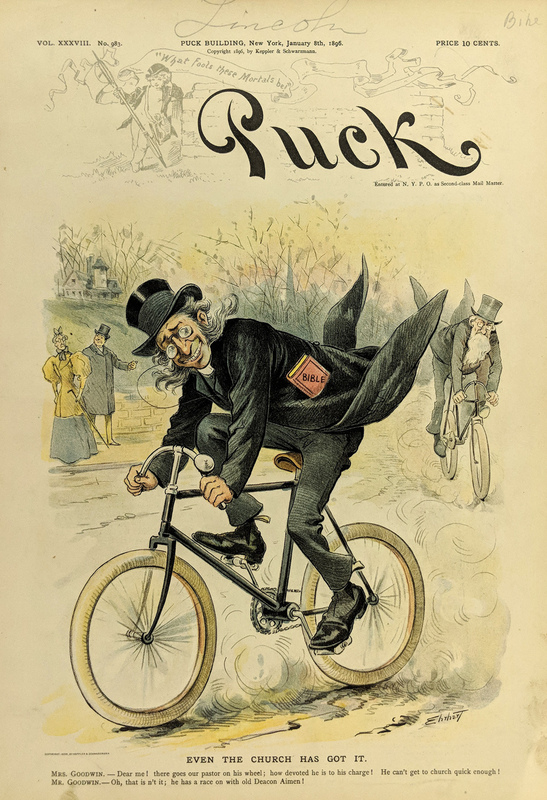 Puck Magazine illustrating how far the bicycle craze has reached, all the way to the Clergy. Dated 1895. Color lithograph. 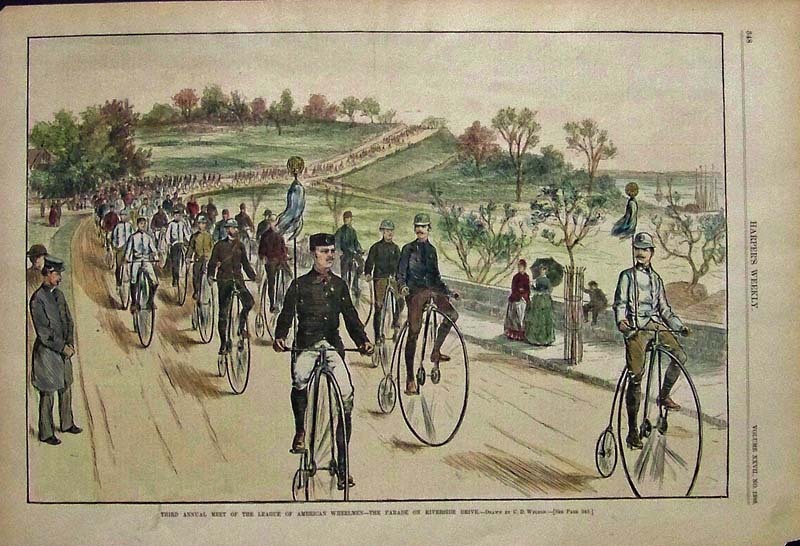 1886 Wheeling On Riverside Drive - Drawn By T. De Thulstrup. 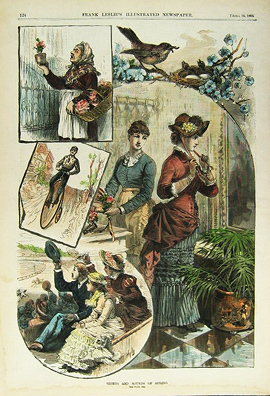 Hand colored wood engraving published in Harper's Weekly on July 17, 1886. 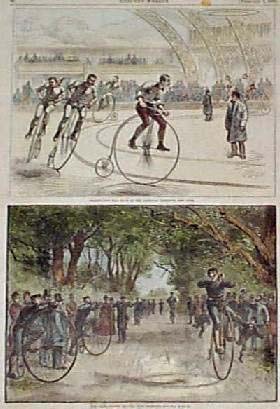 1896 Harper's Weekly "Who Wins" Amateur Sport article about the League of American Wheelmen includes images (top right) of a bicycle built for six, and 3 racers crossing the finish line. 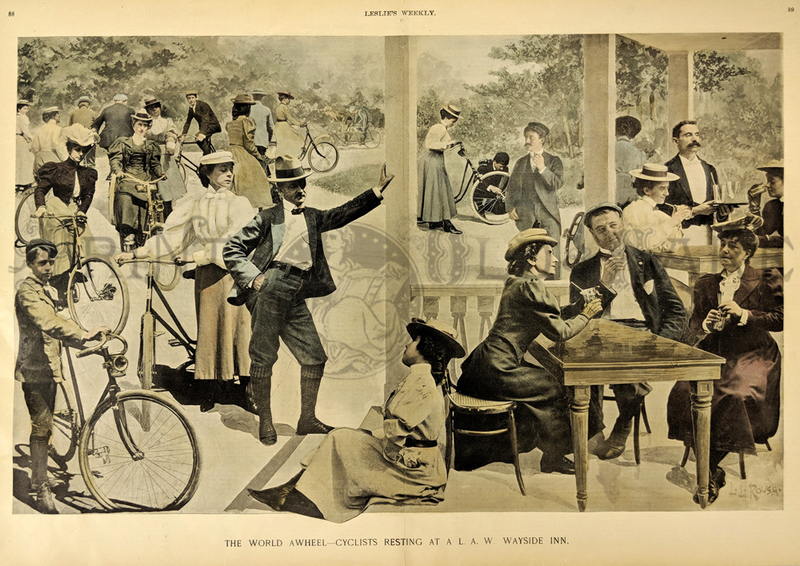 1896 RARE Black and white Will Bradley bicycle ad from the Overman Wheel Company which was featured in The Cosmopolitan Magazine. 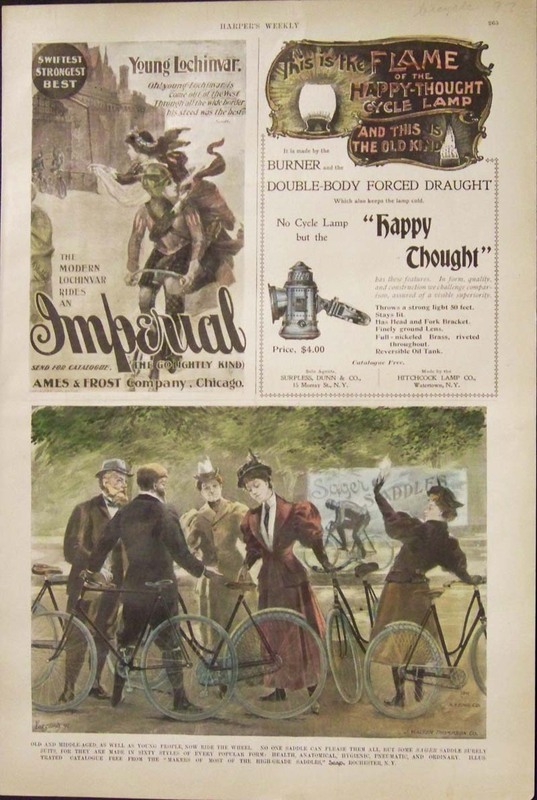 Front of ad shows a woman standing next to her bicycle with the words, "Victor" and "Victoria" lengthwise around her. Fine condition. 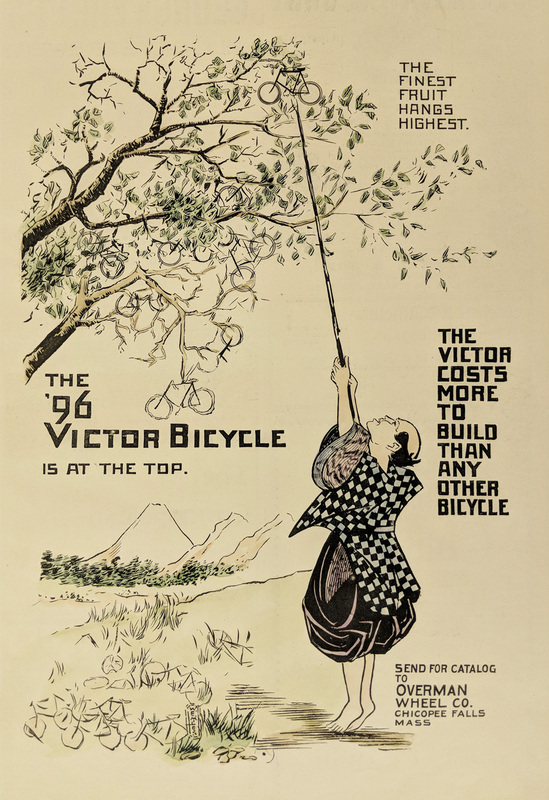 1890 Advertisement for The '96 Victor Bicycle which features the advertised bicycle hanging from a tall tree as someone tries pulling it down. 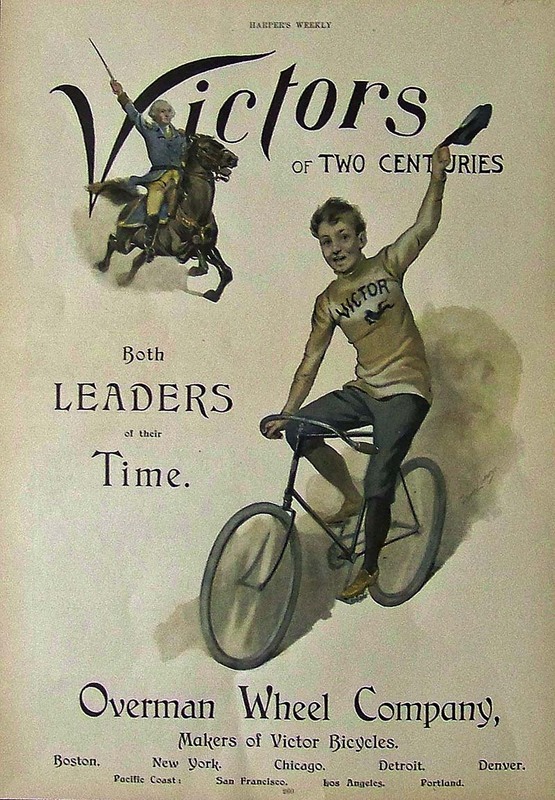 1895 Harper's Weekly color advertisement for Overman Wheel Company, Makers of Victor Bicycles showing how Victors have been popular for two centuries. distance on the far right. 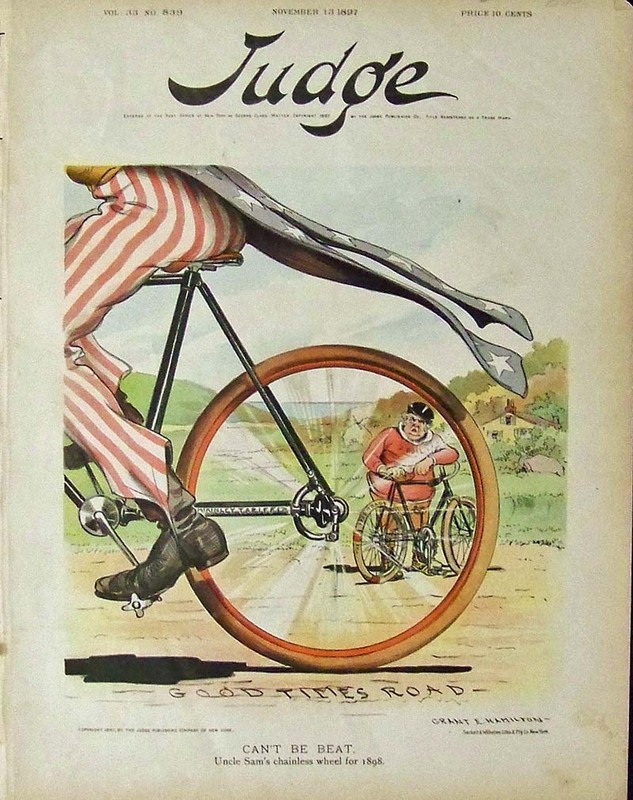 A nice busy hand colored half tone showing "The Progress of the Wheel." 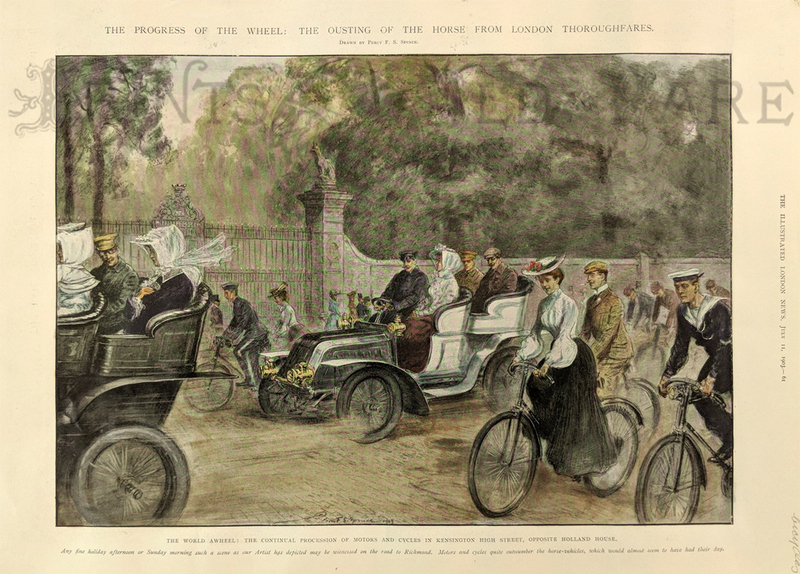 from The Illustrated London News, 1903. 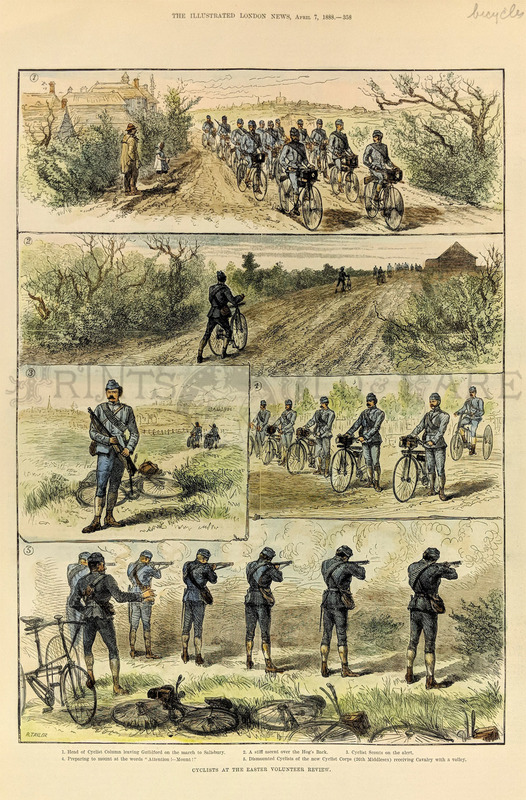 A review of the Cyclist Corps. 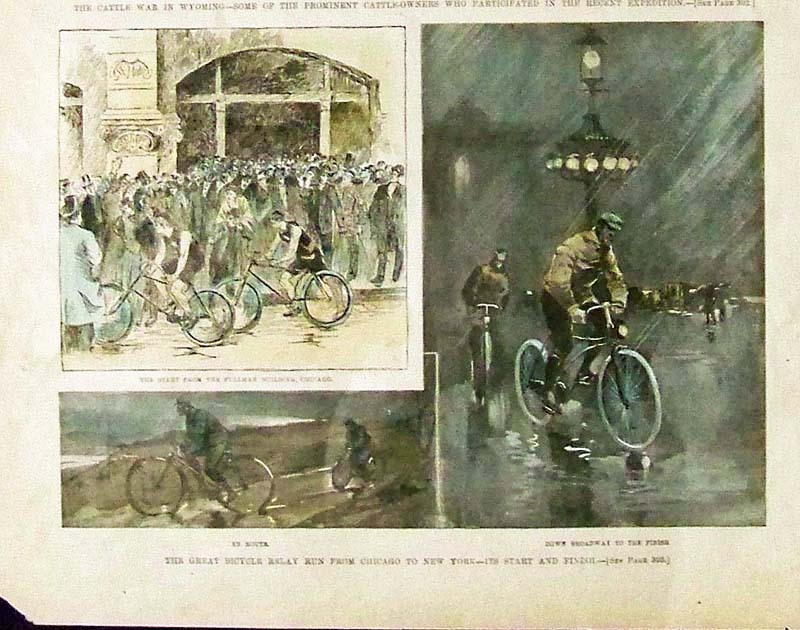 Published by The Illustrated London News in 1888. A nice hand colored wood engraving with numbered identifiers on the bottom. 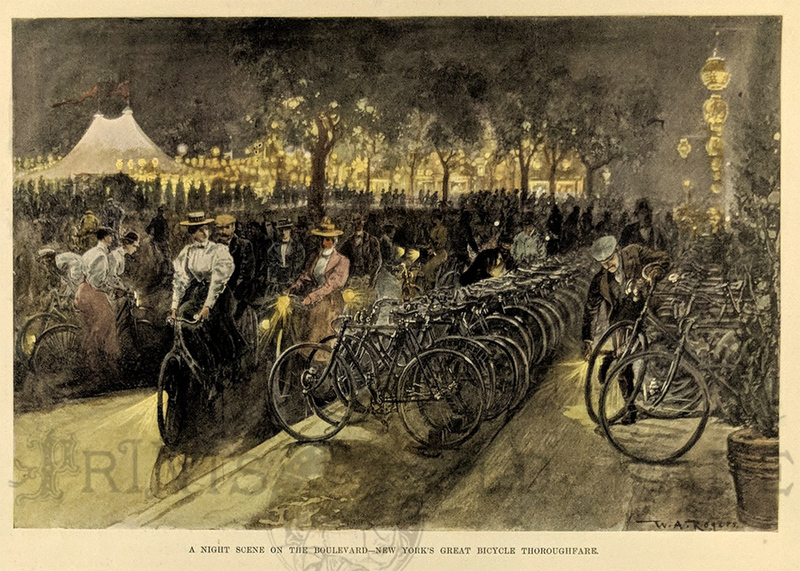 "A Night Scene on the Boulevard - New York's Great Bicycle Thoroughfare." 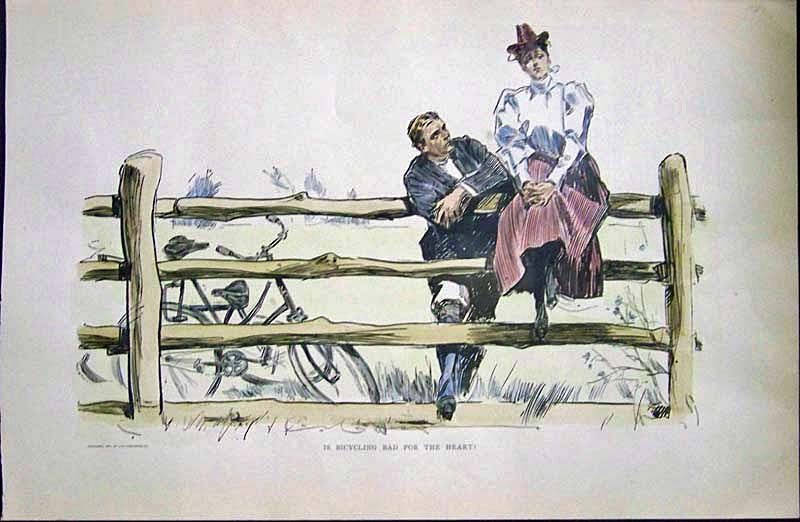 Hand colored halftone from Harper's Weekly 1897. 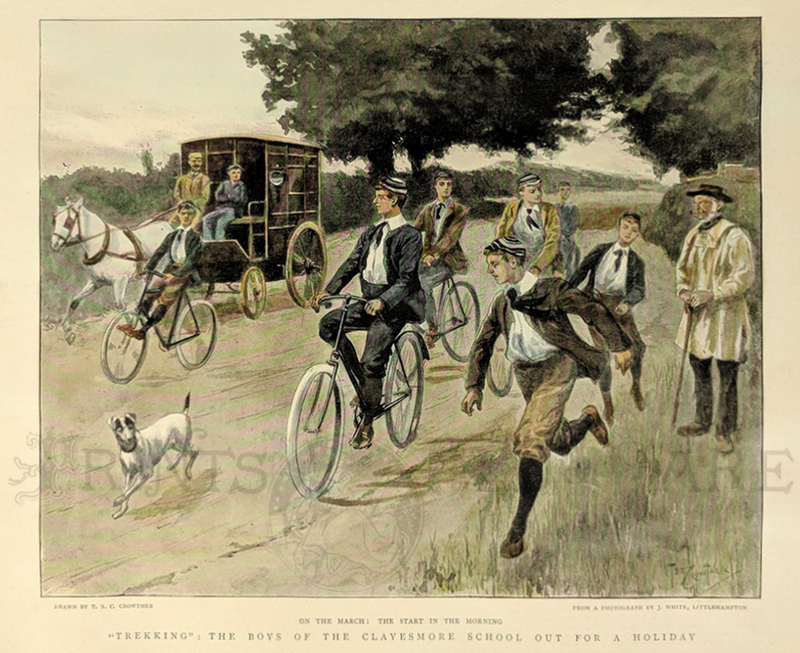 A hand colored halftone engraving titled "Treaking": The Boys of the Clayesmore School Out for a Holiday." 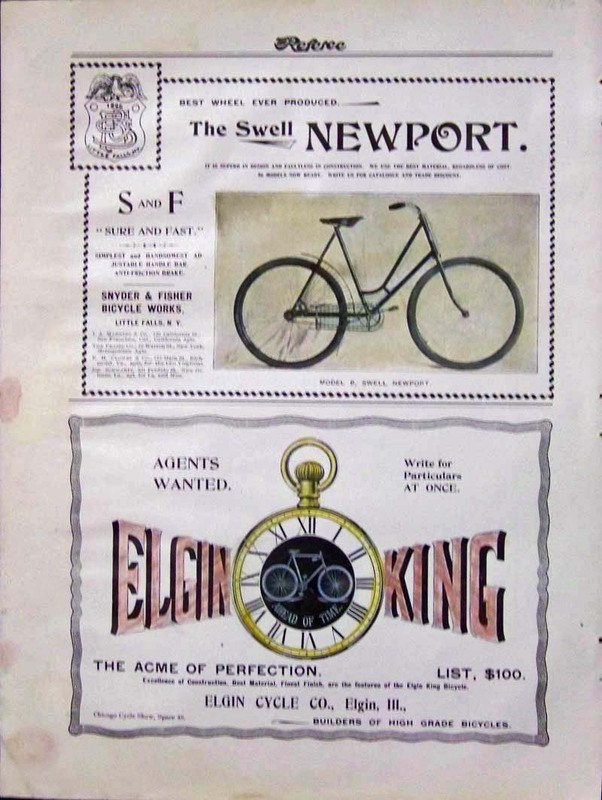 Published by The Graphic in 1897..
1904 Half-tone advertisement featured in Scribner's Magazine Advertiser showing Bicycle Innovations from Pope Manufacturing Company. 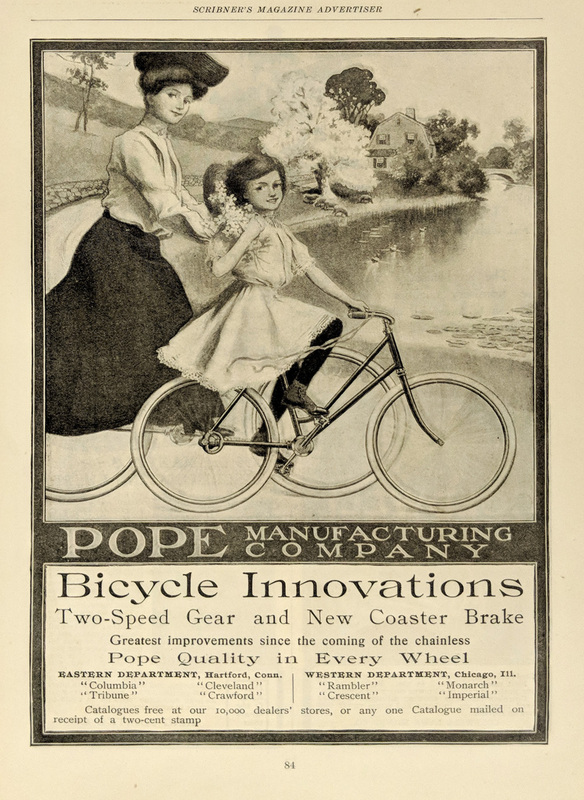 Half-tone image is of a young girl and her mother riding their two-speed gear bike with New Coaster Brakes. 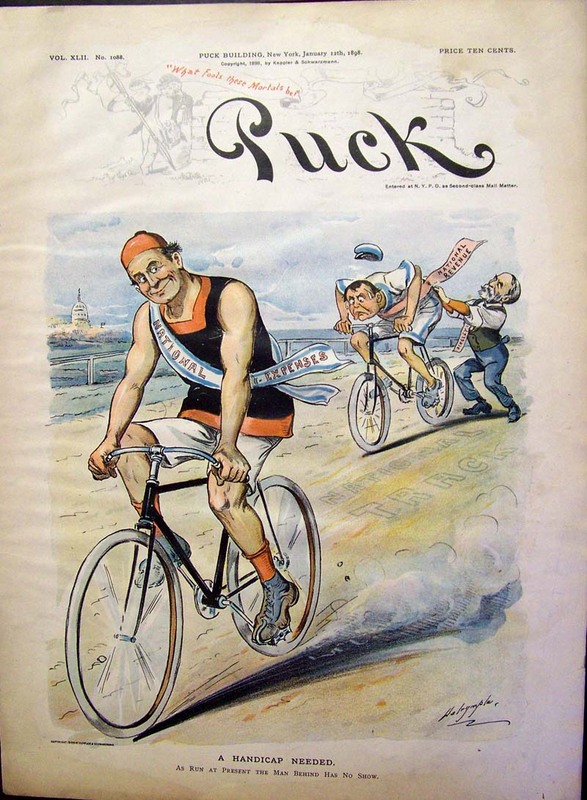 1898 Political Puck chromolithograph, "National Expenses Can't Keep Up With National Revenue." 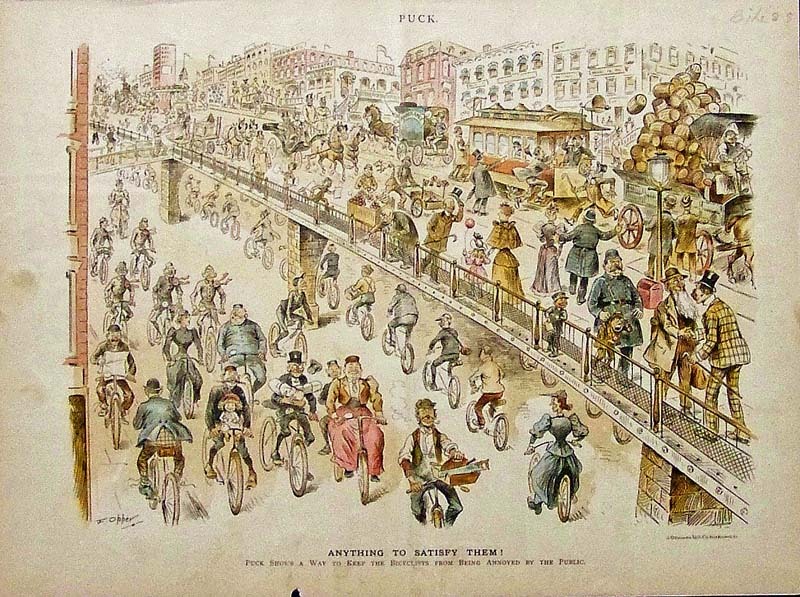 and other bicycles of that era. 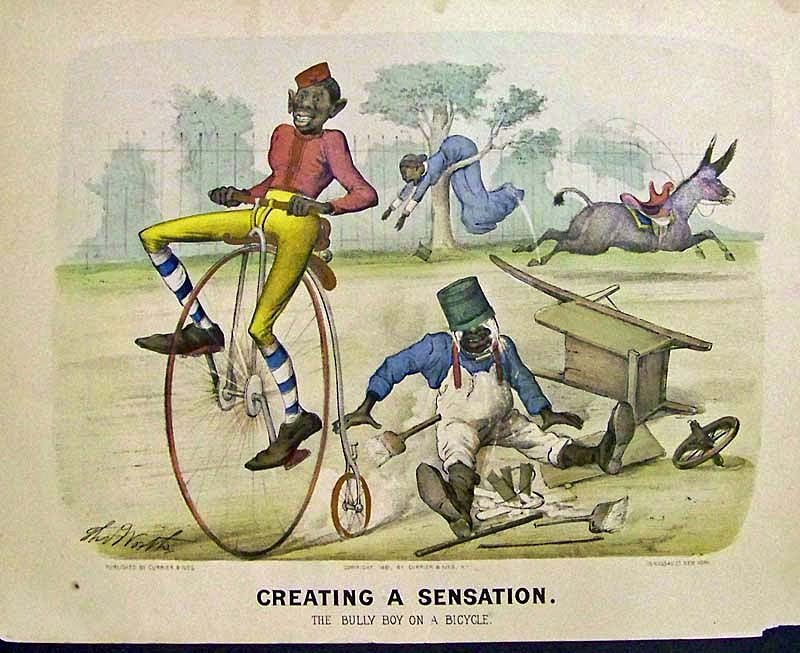 1881 Currier & Ives/Thomas Worth Blackville hand colored lithograph titled, "Creating A Sensation. 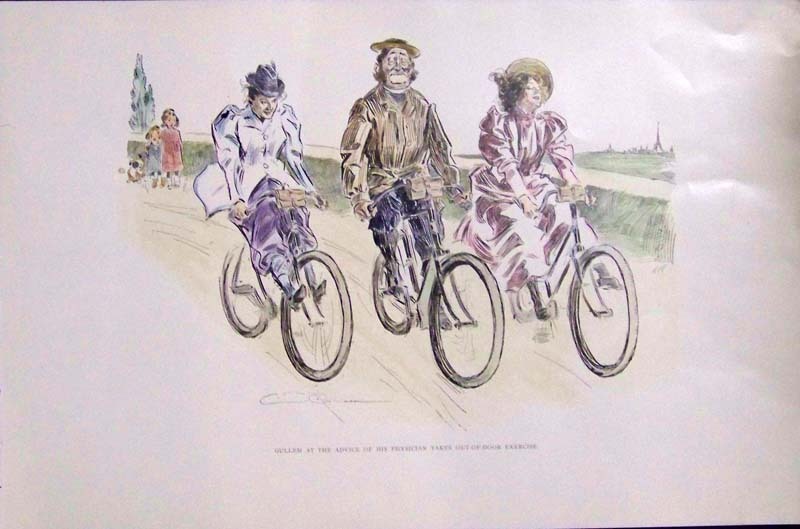 The Bully Boy On a Bicycle." 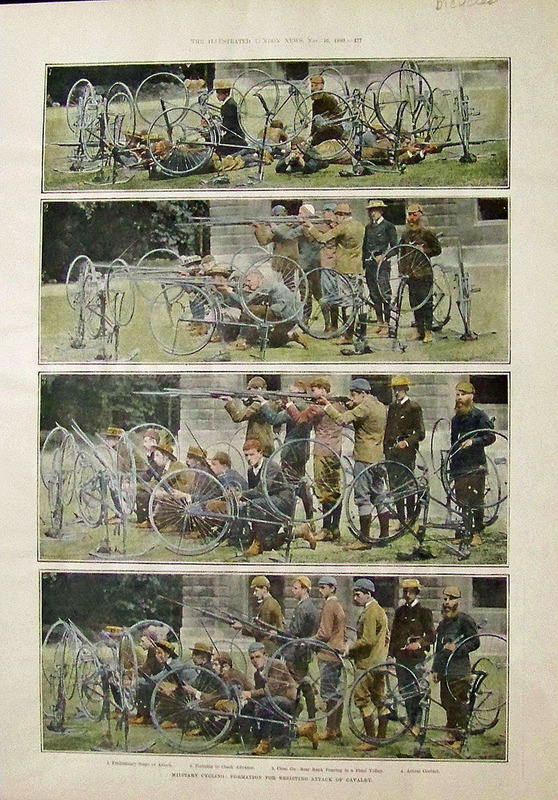 1889 Hand colored half-tone images featured in The Illustrated London News showing the Military Cycling Formation for Resisting Attack of Cavalry. Four scenes in all. 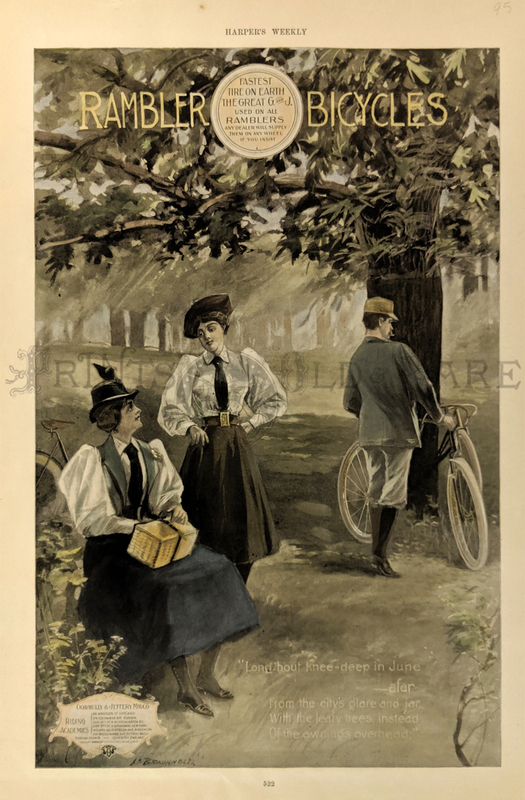 1895 Harper's Weekly hand colored half-tone advertisement for Rambler Bicycles. Image by L. Braunnold. 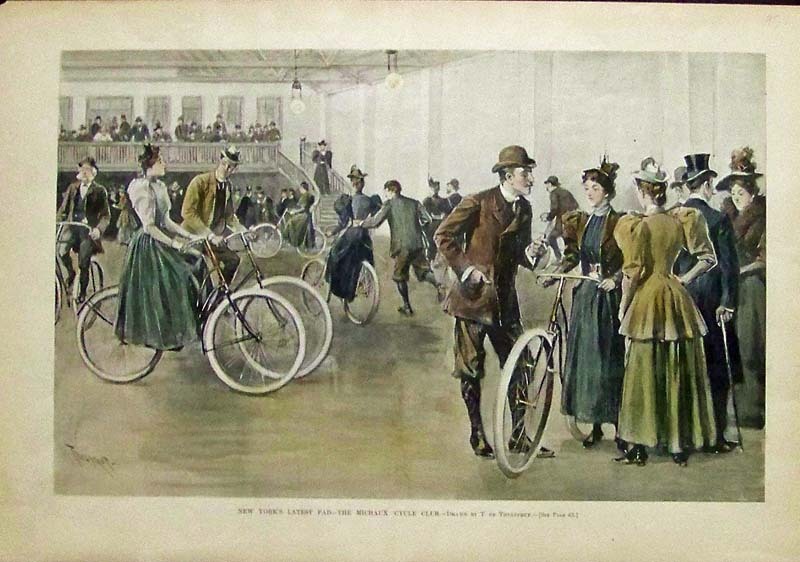 1895 Harper's Weekly hand colored half-tone image showing New York's Latest Fad -- The Michaux Cycle Club. Drawn by T. De Thulstrup. 1899 Leslie's Weekly hand colored half-tone titled, "A Strange Midwinter Scene off Sandusky, Ohio." 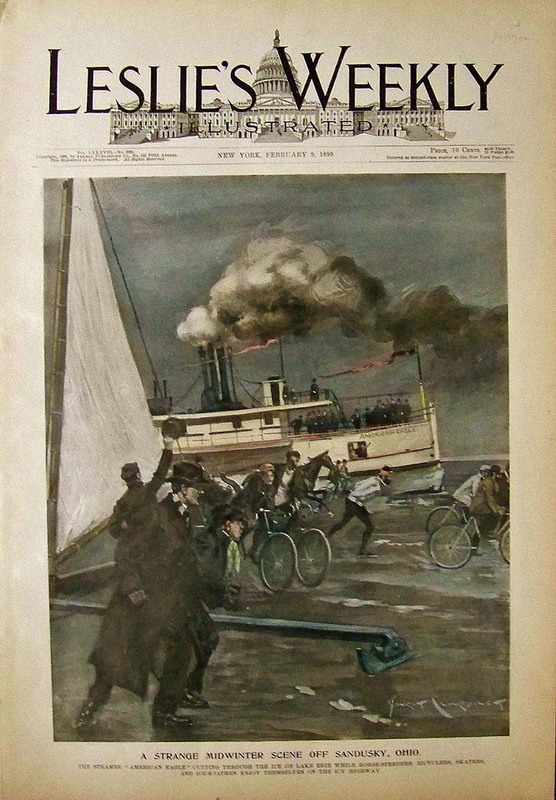 Scene shows The Steamer "American Eagle" cutting through the ice on Lake Erie while horse-speeders, bicyclers, skaters, and ice-boatmen enjoy themselves on the icy highway.